The Gorkha Janmukti Yuva Morcha leaders today said its members will organise rallies in support of Gorkhaland here every Thursday until the Union home minister gives a positive assurance on the statehood issue, a move that comes days after Bimal Gurung told the youths to speak their hearts out. The announcement of the weekly rallies was made at a meeting following a march of 500-odd youths from the Motor Stand around 11am. 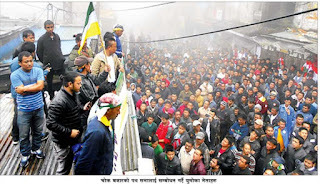 The rally that went through the railway station area and ended at Chowk Bazar was organised by the Yuva Morcha of Tukvar, Lebong, Badamtam, Phoosbshering and Darjeeling Sadar I constituencies and Darjeeling town. "We will organise rallies every Thursday until the Union home minister gives us a positive assurance on Gorkhaland. We have to remain disciplined to achieve our goal," Siddhant Rai, the assistant secretary of the Yuva Morcha central committee, said at a meeting after the march. He asked the hill youths owing allegiance to Trinamul and the Jana Andolan Party to return to the Morcha. "The youths of JAP and TMC should return as Gorkhaland is needed for them also. 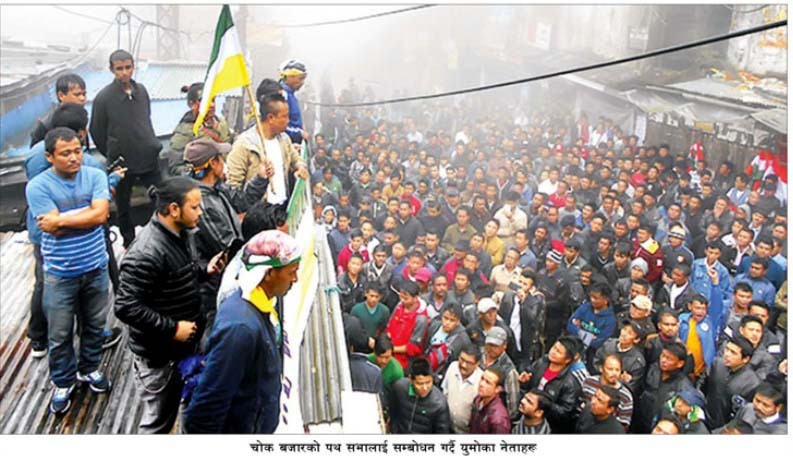 Their parties will never raise the Gorkhaland demand," he said. On Sunday, at a public meeting at Tukvar, Gorkha Janmukti Morcha chief Gurung had said: "The youths should speak their hearts out, the youths should talk about dignity, about the land, the land wanting blood. The youth brigade should talk about an agitation like the '86 agitation. They should talk about lifting guns and wielding khukuris. This is what I had told them." The next day, Morcha leaders said Gurung wanted a boudhik (intellectual) movement for Gorkhaland. Yesterday, Yuva Morcha leaders had said today's rally was to show that "the youths have not forgotten the Gorkhaland demand" and the march was "part of the boudhik movement for Gorkhaland". On August 2, a Morcha delegation had met Union home minister Rajnath Singh in New Delhi and party general secretary Roshan Giri had said that Singh said the Centre would hold a meeting to look into the issue of forming a committee to examine the Gorkhaland demand. The Morcha had made a similar claim earlier but there has been no official word from the Centre.